LX fielded a nice mixture of 60s/65s/70s John Smith and Rod Cochrane had come in as late replacements, although Roger Lomas had to pull out after arrival with bruised ribs which had not recovered from the previous weekend. After the first three games it appeared that LX would not be able to retain the trophy won at Ronchin last year. Despite having most of the possession in the three games they had not scored any goals , seemingly having left that ability on the ferry or in the chunnel . They had the better of the first game against a French team and despite dominating the early part of the 25 min game and not converting 5 short corners , went one down when a French break away resulted in a short corner which was converted with a simple stop and hit , We pushed hard for the equaliser but another two short corners came and went and another French breakaway had exactly the same result as the first and we were 2-0 down and that is how it stayed. In the evening gloom we totally dominated the Italians but again failed to score in a 0-0 draw. The goalkeeper never touched the ball in either game (refusing to pick the ball out of the net against France) and our full back said he touched the ball 7 times in all throughout the two games. Bob Grenside had some penetrating runs but we could not put anyone on the end of them. We probably had our hardest game on Saturday morning against Wales 's predominantly over 60 team in an even game but again failed to score. Rod Cochrane combined a defensive first half of the game with an attacking second but we could not develop possession into goal scoring opportunities and again the game finished 0-0. However it was a bit like like buses - you wait all weekend and then suddenly four come along at once. In the final game we won 4-1 , a score that became critical a little later. John Smith opened the scoring the early on and in a much improved team performance Rod Cochrane added another. There were bonus points for scoring the first three goals so the team were relieved when Zahid Arain scored the third. Sudesh had a good game in midfield and Alan Jackson kept their dangerous right wing quiet. We had a mental blip and Germany scored from a well executed short corner. However after an attempt by a rejuvenated Bill Warrender was disallowed , John Smith added his second to maintain the three goal cushion. How important this was did not become clear until the table was consulted after the match. This result meant we could still qualify for a semi final place if the French team team did not beat the Italians or score 2 goals in a draw. That game started well for us when the Italians took the lead but with seven minutes to go the French equalised, The French continued to press and there was a great save from the Italian goalkeeper. With time counting down the French were awarded a penalty corner, This was twice taken but the Italians survived and so did we. We finished equal with the French on points and goal difference but had scored one goal more , albeit all in one game! We now faced Scotland early on Sunday morning in one semi final and Wales played Egypt in the other. After taking the lead with a Zahid Arain short corner strike with about 10 minutes left , we controlled the game but we gave the ball away and with the help of a foot Wales broke quickly and after an initial good save by the keeper we conceded an equaliser with just 8 secs remaining. Strokes ensued and we qualified for the final with a 4-3 win. Scotland went first and scored but Rod Cochrane unluckily hit the post with our first and they slotted their first three with ominous ease. However we scored all our remaining strokes with Geoff Furneaux and Bill Warrender keeping us in the hunt . 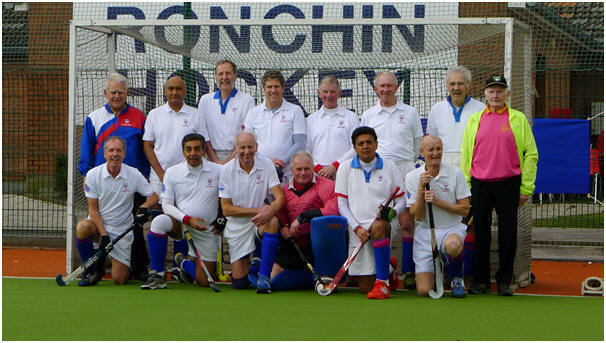 John Ingram-Marriott made a brilliant save of their fourth with a diving stick stop and the Zahid Arain putting us level .John IM , complete with pink Boa , saved their final attempt and captain John Maylam slotted our final stroke to put us in the final. The final was a repeat of the Saturday morning pool game after Wales beat Egypt in a game umpired by Eugene Murphy and Roger Lomas . We took the lead with a short corner early on from Pami Bolina and had the majority of possession but Wales were always dangerous on the break and Bill Pickersgill had to be alert to snuff out their attacks. Geoff Furneaux made a lot of penetrating runs from right defender and the mid field of John Maylam , Zahid Arain and John Smith gave us the control we had been missing in the earlier games.No further goals ensued so we were worthy winners, at least after the first three games . Man of the tournament was the team according to John Maylam as everyone contributed to an improving team performance in each game. Alan Jackson who has played in virtually every year since this tournament started some 20 years ago commented , this was the most enjoyable cohesive squad, on and off the pitch, that I can remember, brought about because of the thorough organising by Sudesh and skillful man management by John Maylam. Thanks to our team of supporters , although Gill Warraeder will remember her trip for her time in a French A&E after being knocked over inside a shop and dislocating her shoulder, Pam Nayar with help from Eugene provided the necessary chocolate and snacks , for which we were most grateful , and it was nice to see Penny Furneux and Pat Pickersgill . Some good nights out in the centre of Lille were most enjoyable , despite the inclement weather. For once LX provided more umpires than anyone else with official umpire Eugene Murphy and injured Roger Lomas umpiring about a third of the games..